As Diego Costa sending-offs go, this seemed like a fairly innocuous one. He has a voluminous body of work in misconduct on the soccer field. To say he has a short fuse is to dramatically overstate the distance between the spark and the keg. In a 2-0 loss to FC Barcelona on Saturday, the fiery Brazilian-born Atletico Madrid and Spain striker was sent off in the 28th minute, precipitating Barca’s title-confirming victory. It was the 11th red card of his club career, meaning he will be suspended for the 30th time in his 13 campaigns as a professional. The gargantuan eight-game suspension levied against the 30-year-old this time around, far longer than any of his previous bans, will bring his lifetime tally of missed games through disciplinary action to 43. But compared to the smorgasbord of stomps, headbutts, elbows and other assorted shenanigans that have seen Diego Costa ejected or suspended from games, there was, to the cameras, no discernible offense for referee Jesus Gil Manzano to send him off. Of course, we later learned what Costa had told the referee as part of his usual intimidation campaign. It’s unpublishable, but it’s something to do with a bowel movement, the referee’s mother and her purported occupation. He was handed the second-longest suspension in the history of Spanish soccer, per Marca, and the longest for verbal abuse. The lengthy – and entirely justified, but we’ll get to that – suspension consisted of four games for insulting the referee and four more for grabbing Manzano several times after being shown a red card. 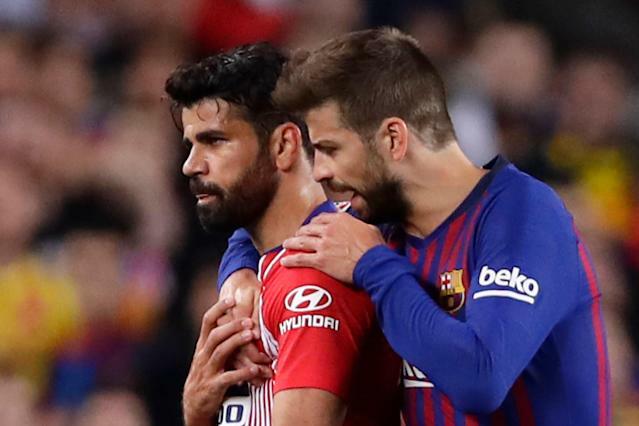 Costa had to be coaxed off the field by Barca’s Gerard Pique, a Spain teammate. With only seven games remaining in Atletico’s season, Costa’s season is effectively over, making it a disappointing campaign of just five goals in 19 appearances. And while Athletico’s place in the Champions League next season is safe, with a 13-point cushion between its second place and Sevilla’s fifth, Costa’s expulsion nevertheless ended the Mattressmakers’ title challenge. The 11-point gap with Barca is now, in practice, insurmountable. That away game was challenging to begin with, but playing with 10 men for an hour made it impossible. Still, his club came to Diego Costa’s defense. “I think it’s too much,” teammate Thomas Partey told reporters, per BeIN Sports.“It isn't fair and I hope we talk to them and they lower their sanction, because of the circumstances.” He did not further elaborate on what those mitigating circumstances were. There are no “circumstances” or threshold of “fouling a lot” that justifies saying that kind of thing to a referee. La Liga was right to sideline Costa for as long as it did. Because at a certain point, the messaging about respect for referees falls flat if it isn’t backed by commensurate punishment. Watch players interact with match officials in the world’s most high-profile leagues, and it doesn’t take a lip-reader to see what refs have to put up with on a weekly basis. It’s caused a crisis at the amateur and youth levels of the sport, where far too few are willing to sign up for that kind of treatment, and understandably so. Especially when you add in the physical violence that is a persistent threat. Certainly, the sport has made efforts to help referees by adding fourth officials, extra assistant referees behind the endlines and the video-assistant referee. But it hasn’t fundamentally changed the power dynamic at the very center of the game. How, after all, can referees be put in a position of authority when they wield very little recourse against disrespect? And why, conversely, have players been allowed to act with near-impunity for so long? It's little wonder that players continue to crowd and hound and harass referees in spite of the recent adoption of specific rules forbidding it. It’s this quasi-lawlessness that makes some games feel like a free-for-all that discredits the sport. So no, this suspension isn’t too long for a serial offender like Diego Costa, who has so many prior offenses that a legal system would likely consider him incapable of rehabilitation. For a player who has made a career out of threatening and gamesmanship, eight games in the stands to think about all the ways in which he’s flagrantly belittled referees is just right.